The Oly 35 RD belongs in the elite small group of compact 35 Rangefinders with faster than f/2 lenses, automatic exposure, and manual over-ride. 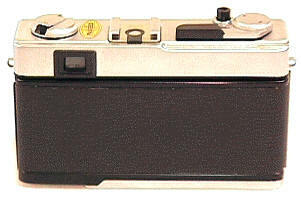 It competes with the Leica CL, at far less cost. Compact 35 Rangefinder with six element 40/1.7 lens, focusing to 34"
VERY Nice viewfinder/rangefinder with AE selected F/stops in finder when it's cleaned. These 70's cameras were comparatively modestly priced and not well sealed against dirt. After 30 years, the finders usually fog or haze up. Sometimes a little, sometimes a lot. Do not use one of these on a regular basis without making sure the finder is as clean as it gets. Case in point, I thought I had a relatively clean Olympus RD finder. I had it cleaned anyway when I was doing a shutter lubrication. It made ALL the difference, turning an OK finder into a bright very usable finder. The RD has Guide Number Automatic Flash exposure! What's that you ask? A great way to get accurate flash shots. Before flash units electronically set their exposures, photogs had to manually set the f/stops to the flash every time they refocused per the inverse square law. Nope, not going to get into it, if you are not familiar with it, look into a good intro photo text book. Anyway, you set the f/stop ring to the flash symbol, and set the camera to the GN number of your flash (GN 45 to 90 in feet, 14 to 28 in meters), and then just flash away. As you focus, the f/stop will automatically with the focused distance to give you the correct exposure. This system is often is more accurate than electronic flash control since it can not be fooled by dark or light subject deviating from the standard gray. 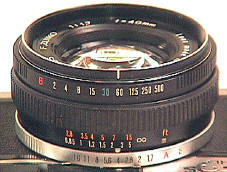 IF you are a Nikon or Topcon SLR fan, you might remember some lenses using this GN system. 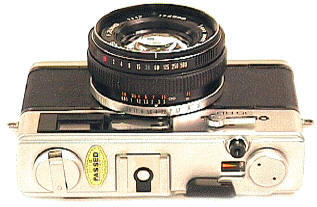 An unusual feature is that the Viewfinder will still show the chosen f/stop on manual exposure. Most compact 35's have no finder indication of f/stops when on manual. Electronic Flash sync at all speeds, 1/2 to 1/500 plus B. Lens caps serves as ON/OFF switch to save battery current. The battery off switch is the lens cap, which on the lens stops current flow. 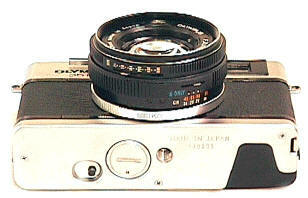 No metering in manual mode, typical of this 70's class of camera. Uses the outlawed in the US Mercury 625 batteries. Though new old stock mercury batteries can still be found occasionally, the best solution may be having the camera adjusted to take the alkaline battery replacement. 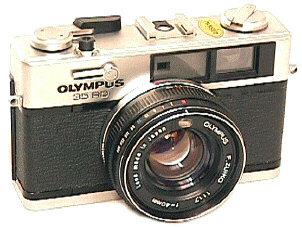 To really appreciate the Olympus RD you need to try to find a new camera today with its features. You can't. 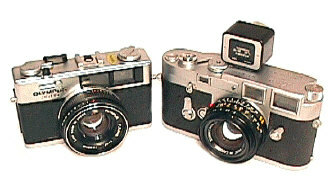 There are simply no compact rangefinder cameras made today with a faster than f/2 lens. If you want available light and quiet shooting on a budget, this is an excellent choice. Olympus RC and RD: 2 oz and 1 1/3 f/stops apart. Olympus RD and Leica M3 with non-aspheric 35/2 Summicron and Voigtlander Kontur 35mm finder: 8.5 oz and $1650 apart. Hmmm. Generally much less expensive than the similar RD. Revised: November 28, 2006 . Copyright � 1998-2006 Stephen Gandy. All rights reserved. This means you may NOT copy and re-use the text or the pictures in ANY other internet or printed publication of ANY kind. Information in this document is subject to change without notice. Other products and companies referred to herein are trademarks or registered trademarks of their respective companies or mark holders.